Today I’m sharing 2 different ways to wear this versatile black culotte jumpsuit from Nordstrom. It’s definitely cute enough to wear by itself but here I’ve layered it a bit to show how it can easily transition to Fall. It’s hard finding petite pants that fit me well and I’m so glad I found these tailored fit Avery Pants from Banana Republic. 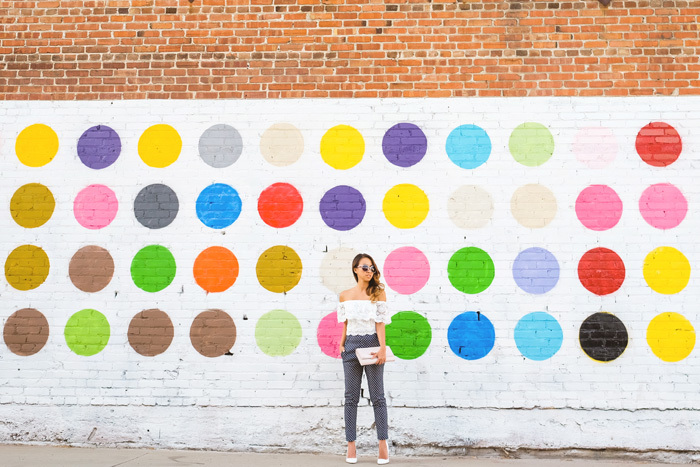 The pants have a great fit and style and they come in a variety of colors – I’m wearing the fun pink ones here but I also love the polka dot print pants and the grey windowpane print pants – both which are great as Fall transitional pieces. I also just love how these pants can be casual fun or dressy! Being petite, I’m always looking for ways to look taller and these wide leg pants perfectly elongate my frame. The size 00P from Banana Republic is pretty true to size and I wore them with my tallest wedges so I didn’t have to get the length altered at all. Yes I’ve always been obsessed with off the shoulder tops and this crop top, stripe version from my boutique, Morning Lavender pairs so well with the pants and keeps the illusion that my legs are longer than they really are =P. I love combining pretty colors – such as this love combination of pink + grey. These pretty hues add a feminine flair to what is considered a casual look. I am in love with my new roll up chinos from Banana Republic which are comfy and flattering at the same time. I am also wearing my new crossbody tote bag from Madewell which is the perfect size for me! I love how you can wear it three ways: crossbody, on one side, or as a satchel. It holds everything I need without overwhelming my petite frame. 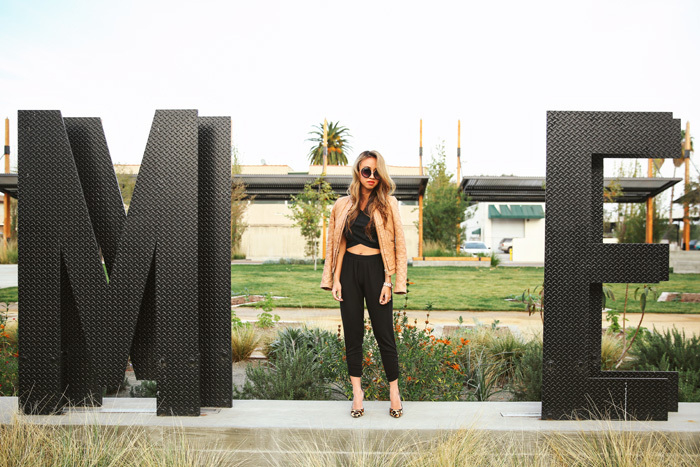 I seriously have spent most of last year searching for the perfect wide leg black pant! I wanted them to be high-waisted and the pant leg to be wide but not too wide where my small frame looks like I am swimming in them! And then recently I found the perfect pair from Ann Taylor. I got these pants in size 00 Petite and they fit me perfectly and they are currently 60% off! 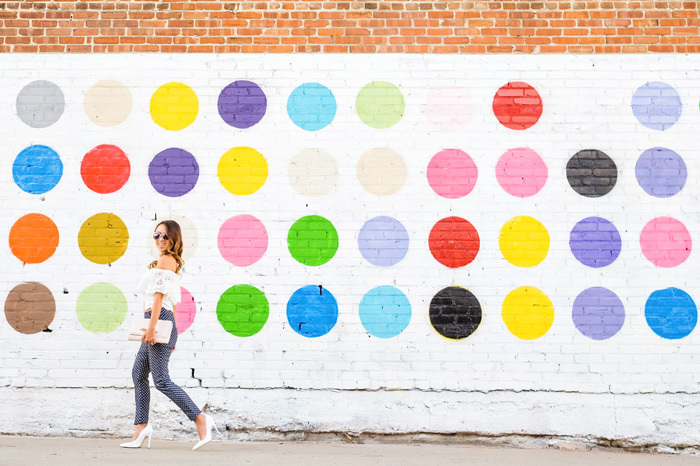 I love the silhouette of the pants and with a pair of black heels or booties – you can amazingly look way taller. I also paired the pants with a lovely blouse also from Ann Taylor (and 40% off) and my classic camel coat from Morning Lavender. 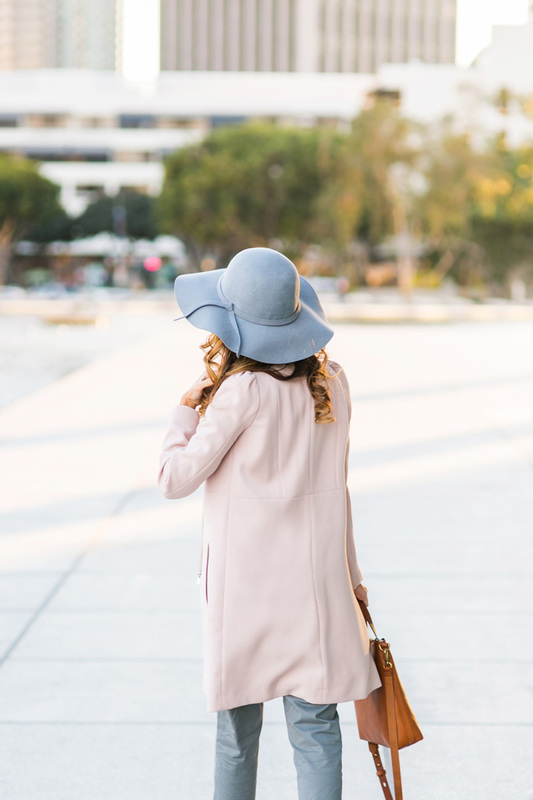 I love this head-to-toe chic workday look! It’s time to get cranking in 2015! Here’s a great peplum top that can be worn dressy or casual – dress it up with nice pants or a pencil skirt or a more casual look with jeans. 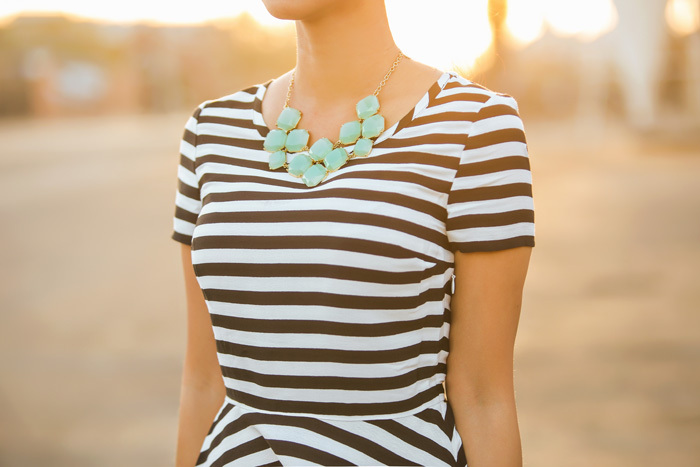 I love the shape of this top and the black & white stripes. Horizontal stripes are not always the most flattering but this top works because of the fit. I got the top in a petite size so the waist part hit at the perfect spot and didn’t make my torso look too long (or my legs too short – gotta get any help I can get :)). I paired it with these great fitting camel pants from Banana Republic for a classic look. Peplum Top – 00P Banana Republic find it HERE – ON SALE NOW! I have been searching forever for harem pants that fit me and don’t look like baggy pajamas pants on a teenage girl. Every time I see my taller friends (and most of my friends are taller than me) wearing them I get seriously jealous because they look so darn comfortable and cute. But low and behold I found the perfect pair that fits my size and they are on SALE HERE at Nordstrom!!! On a less petite person, they might be a lil’ on the shorter size but they are perfect for us petite gals. And did I mention they are super comfy?! You can wear them casual or dress them up with a cute pair of heels.